"On the way down, it was just like a daze. And I just remember thinking like, 'Man, I got to get to the car, just get to the car,' " Azuela says. "Then, just — black." Azuela collapsed in the parking lot. By the time the ambulance arrived, the asphalt had singed his arms and legs, causing second-degree burns. 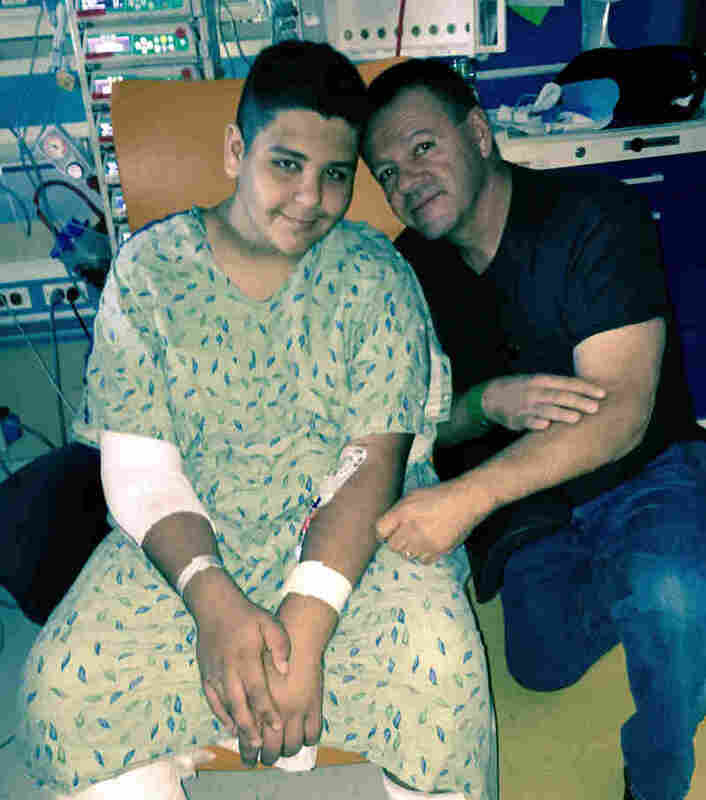 His mother, Alicia Andazola, arrived at the emergency room to find her son covered in ice. His body temperature was approaching 108 degrees. Doctors removed Azuela's blood with a machine to cool it. "His organs started failing," she says. "We weren't sure for the first couple of days if he was going to make it." More than 155 people died from heat-related causes in the Phoenix area last year, a new record in a place where the number of such deaths has been on the rise. Former Phoenix Mayor Greg Stanton deemed it a public health crisis, and the city has launched an overhaul of how it prepares for and deals with extreme heat. Just as other places prepare for hurricanes, Phoenix aims to create a model program for coping with the temperature spikes and heat waves that scientists say are becoming more common across the country as the climate warms. That effort includes trying to actually lower the temperature of the city. Already, more people die from heat-related causes in the U.S. than from all other extreme weather events. And as with other disasters, the most vulnerable are the elderly, the sick and the poor. "Heat is like a silent storm," says Mark Hartman, Phoenix's chief sustainability officer. "Our goal is to actually say, 'To be heat-ready, here are all the things you need to do.' "
Extreme heat is certainly not new for Phoenix, and many cities are taking steps to cope with higher temperatures. But Phoenix has the distinction of having more than 100 days a year that are above 100 degrees. Headlines of people succumbing to heat — on trails and streets, in cars and homes — are a tragic staple of summer. And the problem is getting worse. Already, the city has six more days above 110 degrees than it did in 1970, although the all-time record of 122 degrees has held since 1990. And, as elsewhere, nights are warming even faster than days. Hartman says nighttime low temperatures in the Phoenix area have gone up an average 9 degrees in recent decades. "We have more of these days that are at, near, or slightly above some of the key thresholds for public health," says David Hondula, an assistant professor at Arizona State University's School of Geographical Sciences and Urban Planning. Hondula says roughly a third of people who live in the Phoenix metro area experience some kind of adverse health effect in the summer months. Surveys suggest more than a million people are too hot inside their homes. Some with air conditioners say they can't afford to keep cool when the temperature soars. Hondula attributes about half of the city's warming to climate change and the other half to the built environment — the miles of asphalt parking lots and wide roads, the expanding sprawl of low buildings, plus the growing number of cars and air conditioners. "All those machines are dumping heat into the environment," he says, creating what is known as the urban heat island effect. Hondula thinks some of this can be reversed, but it will require a major shift in how the city grows in coming years, especially with summers only forecast to get worse. By 2100, Phoenix summers are expected to resemble the 114-degree averages found in Kuwait, according to modeling by Climate Central. 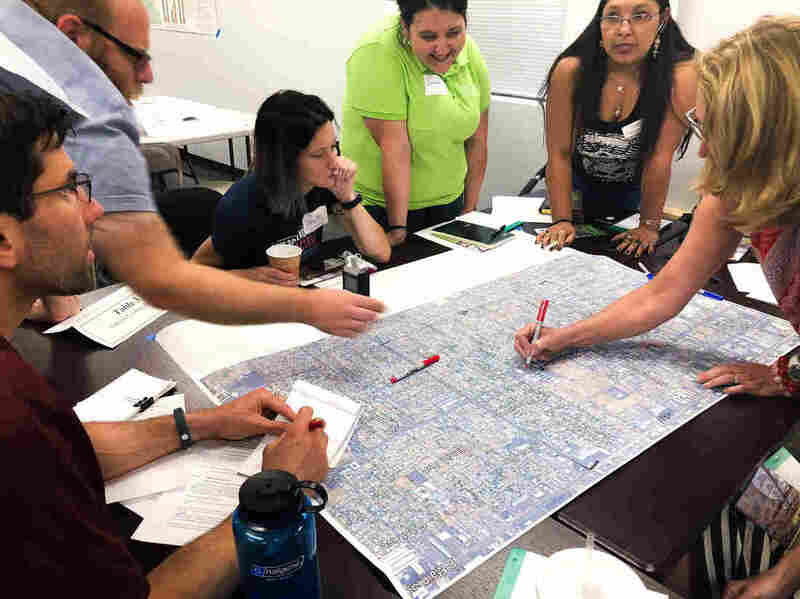 Hondula is working with city officials as they take a twofold approach: figuring out how to keep so many people from dying of heat-related causes and how to bring down the temperature in one of America's fastest-warming cities. 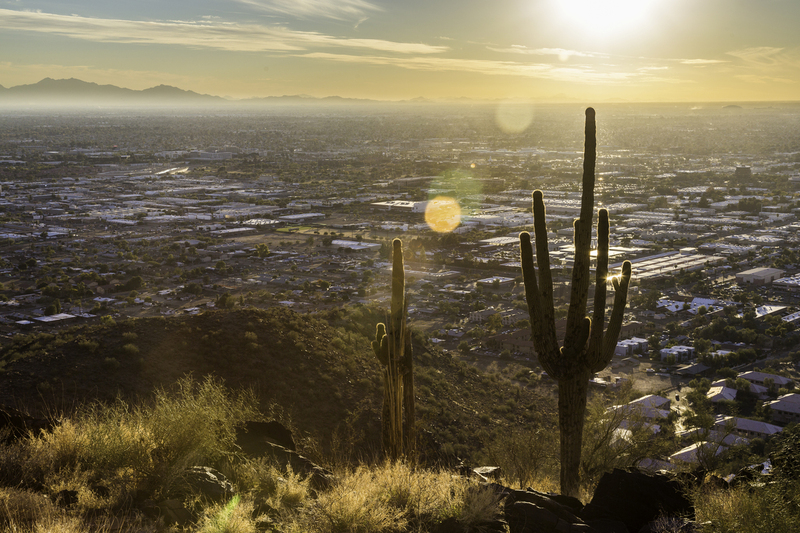 Phoenix hopes to win $5 million for the program as part of a competition by Bloomberg Philanthropies, and officials say it could serve as a model for other places grappling with higher temperatures. "This really is the extreme case," Hondula says. "If they are successful here, then they can be successful anywhere." Communicating about the risks of Phoenix's heat is challenging, says Dr. Rebecca Sunenshine, who tracks heat-related deaths with the Maricopa County Department of Public Health. The area's heat-related deaths peak during July but begin as early as May and last through September. What's more, while it's easy to fixate on the very hottest days, Sunenshine says most heat-associated deaths happen on days with no extreme heat warning. "People die in all different temperatures, and it's not dependent on how high it is," she says. The day Joey Azuela nearly died from heatstroke, the high was 103, close to the area's average for August. "People say 'I've lived here and acclimated,' " says Sunenshine. "But we see people who've lived here for 20 years and who hike all the time die of heat-related illness." Over the past decade, most heat-related deaths in the county were outdoors, with trails and desert areas being among the most common locations. Two years ago, Phoenix considered closing down hiking trails when temperatures reached a certain threshold, but city leaders dropped the idea after substantial pushback. Now the city is testing text alert systems to more aggressively warn people when it may not be safe to be outside, even if there are no emergency warnings on that day. About 40 percent of heat-related deaths last year occurred indoors. Those victims were generally women, living alone and over the age of 75. "Oftentimes, they won't have their air conditioning on, or it will be malfunctioning," says Sunenshine. "Because they are older, their bodies aren't able to detect differences in temperature." Phoenix is looking at installing heat alert systems in the homes of elderly residents. The idea is that they could notify first responders and other volunteers, perhaps neighbors, when the temperature inside a home reached a worrying level. Another group at high risk are the homeless. On an early June afternoon, Jowan Thornton is scanning a downtown park as he holds an orange bucket filled with water bottles. "Hey, buddy can I get you some water?" Thornton asks one man who has taken shelter under a tree with his belongings. Thornton works for the Salvation Army, one of dozens of groups that are part of a heat relief network and are trying to better coordinate with the city on days like this, when the temperature is forecast to break 110. "It's disheartening," he says, "when you see so much need out there." For people living on the street, it's the chronic exposure, day in and day out, that can kill. Thornton sees it firsthand. "Folks who are just really beat down by the sun with no reprieve," he says. And with nights getting warmer, there is not as much relief after the sun sets. The area has many strategically dispersed cooling stations on street corners and inside buildings, and Thornton tries to direct people to them. But not all are open overnight. He comes across one man who says he pours water on himself before he spends nights at the bottom of a dried-up concrete canal. "You do the imitation swamp cooler," the man says. "Get clothes wet and hope you catch a good breeze." Any newcomer to the Phoenix summer quickly discovers that the best parking spot isn't the one close to the entrance. It's the one next to the tree. Creating more shade — a lot of it — is a key part of Phoenix's plan to not only lower the number of heat related deaths, but to also simply keep people cooler in their daily lives. The city aims to have 25 percent shade cover by 2030, but it's still far from that goal. So on a recent afternoon, city employee Michael Hammett is working a line of people at a bus stop, peddling another option. "Have you ever used an umbrella for heat?" he asks Deb Neild. A bit puzzled, she says she's used umbrellas mainly for rain. But she agrees to give it a try. Hammett pops open a black UV-protected umbrella and hands it to her. Neild is surprised when the effect is almost immediate. "Definitely cooler already," she says. "I can feel it." When Hammett presses, she says she probably would use it for relief from the heat, and he lets her keep it. Others are less interested. It's too cumbersome, they say, or they just don't see the benefit. The city is also gathering ideas from residents on how to cool their community. A big focus is low-income and largely Hispanic neighborhoods that suffer disproportionately from extreme heat, a problem that has become more pronounced over time. In some cases, researchers at ASU have measured more than a 10 degree difference between neighborhoods less than 2 miles apart. On a recent day, Maggie Messerschmidt of The Nature Conservancy is going door to door in one such area just east of Phoenix. There are few trees, lots of gravel, bare yards. "We want to learn how to better cope with the heat together," she explains to one woman who lives nearby. That begins with collecting heat stories from locals, she says. "Based on that, we are going to come up with a list of priorities for the neighborhood," Messerschmidt says. Many here are renters, so they haven't invested in shade. One man tells Messerschmidt that he plans to buy houses to rent out, and he is not sure planting trees and shrubs would be worth it. "If it costs me an extra $300 more to maintain the homes because of the landscaping we put in, I'm not making a dime," he says. Messerschmidt floats the idea of a financial incentive to encourage property owners to add cooling landscaping before she moves on. Aimee Williamson of the local nonprofit Trees Matter says the whole mindset around trees needs to change, especially in a place where palm trees often pass as offering shade. "They're not just something that should be lumped into parks," says Williamson. "They should be looked at as infrastructure and prioritized financially in that way. It's kind of a form of preventive health." On another street, Messerschmidt meets a woman who wants a change at bus stops. "The seats are metal," she says. "How the heck are we not supposed to burn ourselves on the metal?" ASU researcher Hondula has other ideas. He says roads can be repaved with permeable materials, and roofs can be painted white or made of other reflective surfaces. If done properly, Hondula says these change could even offset some of the consequences of climate change. Later this year, all these suggestions and others will be vetted for a final action plan. It might even include a specific, measurable target by which to lower the local temperature. Phoenix hopes it can lead the way, as cities across the country face summers that are longer and hotter. This story is part of Elemental: Covering Sustainability, a new multimedia collaboration involving Cronkite News/Arizona PBS, KJZZ, KPCC, Rocky Mountain PBS and PBS SoCal.